When Steve Jobs unveiled the iPad, he pronounced that it was a device designed to fit between the iPhone and Mac. Given the iPad’s price and size, it would be easy enough to dismiss this as marketing hype. Now that I’ve had a few hours with the iPad, however, I have a far better understanding that the “in-between” nature of the iPad runs far deeper than a Keynote presentation and press release. In fact, when using the device, just about everywhere you turn you find a hybridization of the iPhone and Mac OS. Certainly elbow-room plays a part—the device offers the kind of space that allows more elements on screen—but it’s interesting to wade into the device and its applications and see where Apple expanded as well as compromised between the iPhone and Mac. The PIM applications—Mail, Contacts, and Calendar—owe more to the Mac OS than the iPhone. And they do largely because of the roominess of the iPad’s display. The iPad’s larger screen means that you can view a list of mailboxes within a particular account or a list of messages along with a preview of a selected message, much like Mail on the Mac. Unlike with the Mac’s version of Mail, you’re still compelled to move to a separate screen to view all your accounts (a unified Inbox is absent, though Steve Jobs has claimed this feature is coming), but unlike with the iPhone, you can view the currently selected message while doing so. Contacts appear within a book-like interface that falls somewhere between the iPhone’s Contact app and OS X’s Address Book. Like the iPhone app, you can move through an alphabetical list of contacts by tapping letters—though in this case, they’re tabs in an address book rather than letters floating on-screen with no context. Like the Mac’s Address Book, you can view contact names along with the details of the selected contact on a single screen. The compromise in this app is that you choose Groups by tapping a Groups button, which produces a pop-over menu for selecting the group you want to view. On the Mac, groups aren't hidden in a pop-up menu. The Calendar app is very similar to iCal. 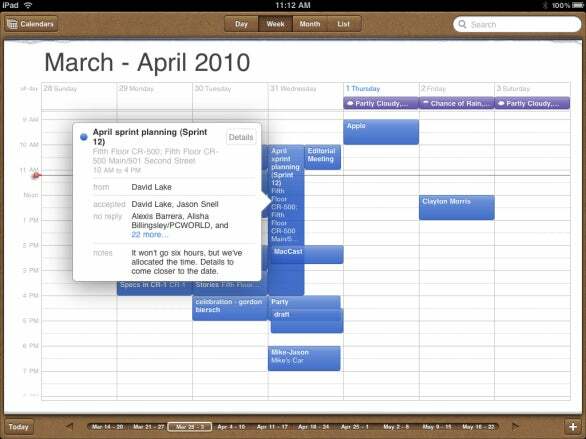 In Day view you see not only events laid out in iCal-like blocks, but the details of specific appointments appear on the left side of the “book.” Week view looks very much like iCal, complete with a pop-up Details window. And from within any of these views you can tap on a Calendars button and choose which calendars you want to view. Safari, too, owes more to the Mac OS than the iPhone. When visiting a Web site that offers both mobile and desktop versions of the site, you see the desktop version. Yet the iPhone’s double-tap-to-expand-columns trick works. The display is large enough that you can have navigation and bookmark controls next to the URL fields rather than at the bottom of the screen. To view bookmarks, you can simply tap a Bookmarks icon to reveal a Bookmarks Menu pop-over, much like a pull-down menu in the Mac OS. And the iPad version of Safari even includes a bookmarks bar-like feature that provides quick access to favorite sites. There’s nothing like Maps outside of a browser on the Mac OS, so naturally the iPad’s version of this helpful application is quite similar to the iPhone’s version. But again, screen space pays off. Directions are available from a pop-over menu that appears over the map view you’ve selected (this version of Maps includes a new Terrain view). 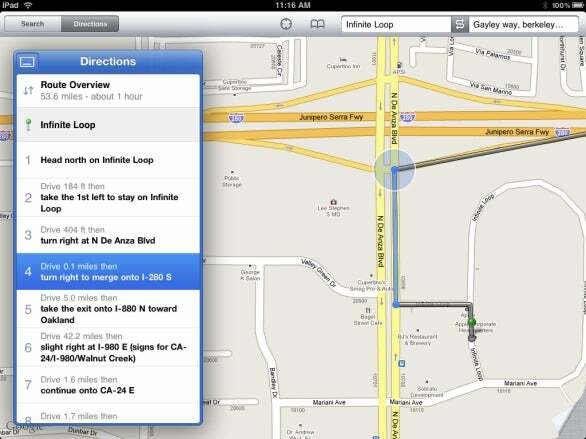 Like the iPhone 3GS, the iPad’s Maps app includes compass capabilities, even though the iPad doesn’t offer a separate Compass app. The iPod and Videos applications are an interesting mix of the iPhone and Mac OS. In terms of browsing your media, they’re very much like the Mac and PC’s version of iTunes. Similar to iTunes on a computer you find your audio content available in a Source list, which includes Music, Podcasts, Audiobooks, iTunes U, Genius, Genius Mixes, and then any playlists you’ve synced from your computer or created on the iPad. Buttons at the bottom of the screen let you view your music by Songs, Artists, Albums, Genres, or Composers. To play a track, just tap it. 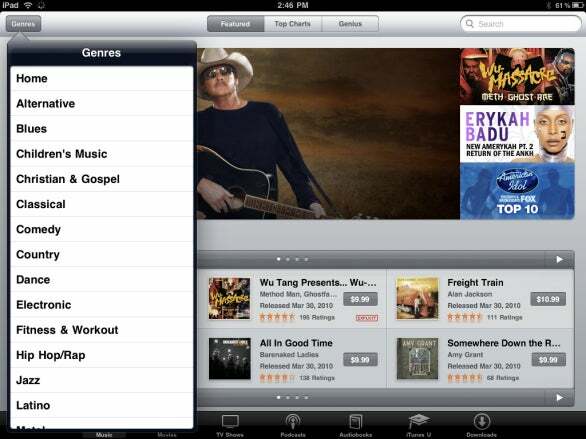 As with iTunes, videos are selected by kind—Movies, TV Shows, Podcasts, Music Videos, and iTunes U. Tap the TV Shows button, for example, and you see each show represented by its artwork. Tap the artwork and an episode list appears along with artwork for that show. To play an episode, just tap the Play button. 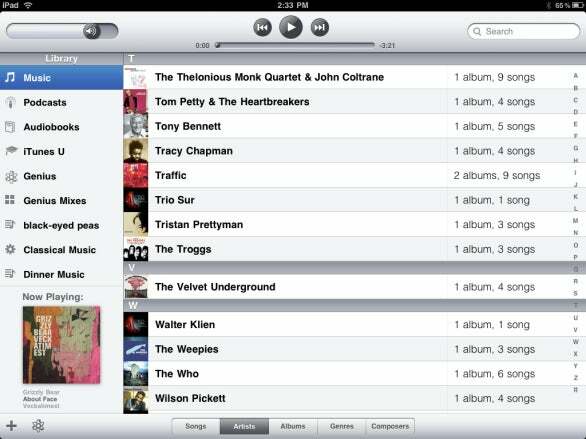 Music as seen through the iPad's iPod app. When you select a movie, you first see a screen filled with details—rating, studio, year released, HD or SD, summary, actors, director, and producers. On this same screen you can tap a chapters button to see a list of chapters. To play a particular chapter, tap it and press the Play button. Watching video on an iPad. Yet when you play music or watch videos, it’s a very iPhone-like experience. Play a song, for example, an the iPad’s screen is filled with album artwork along with volume and play controls, a button for producing a track list, and a Genius button for creating a Genius Playlist based on the currently playing song. Tap the artwork and you see a timeline (which you can scrub through just as you can with an iPhone or iPod touch) and shuffle and repeat buttons. Playing video is an experience identical to that on an iPhone or iPod touch. Play controls are overlaid on the display when you tap it and the top of the display bears a time line (which, again, you can scrub through) and a button for toggling between fullscreen and widescreen views. The iTunes Store has always seemed cramped to me on an iPhone or iPod touch. It’s wonderful that it’s available at all, but I use it only when on the road and I really, really want to hear or watch something. On the iPad, it’s very much like the Store you see when using a Mac or PC. You can more easily find the content you’re after than you can on the iPhone thanks to the Music, Movies, TV Shows, Podcasts, Audiobooks, and iTunes U buttons at the bottom of the screen. And you can see more information about the media you’re interested in. When viewing the iPad’s Home screen you can’t help but notice just how spare it appears. And it is, in part, because it’s missing a number of apps found on the iPhone and iPod touch—Stocks, Weather, Voice Memos, Clock, and Calculator. Many people have offered theories on why these apps didn’t make the cut. One is that third-party apps exist for these things so why would Apple need to duplicate these efforts. And that makes some sense. But it also makes sense that in a world where you carry both an iPhone and iPad, the iPhone does a better job presenting these small-form applications. Does the casual investor really need a Stocks app that fills a screen the size of the iPad? Likewise, how weather-obsessed must you be to want to see radar, satellite, precipitation, and forecast data on a single screen? These are apps that you want to check for quick updates, not in-depth information. For this kind of thing, the iPhone is the better device. Once you’ve used an iPad you understand just how silly the “it’s nothing but a big iPod touch” claim is. Size matters. It’s much more enjoyable to watch video on an iPad. You can actually read a book on the thing in a way that doesn’t feel cramped. The increased size means fewer finger swipes and taps because you can put more controls and information on a single screen. And it’s less likely you’re going to get killed in some shoot ’em up because you tapped the wrong millimeter of the device’s display. A larger device like this also means more room for a larger speaker. On the on-board audio front, the iPad’s speaker sounds much more like a MacBook than an iPhone. Beyond typing, there are things the iPad just won’t do that many laptop users find necessary. Obviously, with its limited storage, memory, and input options, you’re not going to do Final Cut work on your iPad any time soon. Nor is this the device to use for recording your next podcast. But there are more mundane chores that the iPad can’t handle. Printing, for example. Apple provides no solution. And if you want to set up a family member with an iPad, be prepared to bring along a computer so you can configure that member’s wireless network (and keep it on hand if that network ever goes down and the iPad is the only computing device in the home). The iPad as sole-computing-device-in-the-home is still a stretch, given the Wi-Fi requirements. But in-between? Apple’s on to something. It seems like a perfect fit.